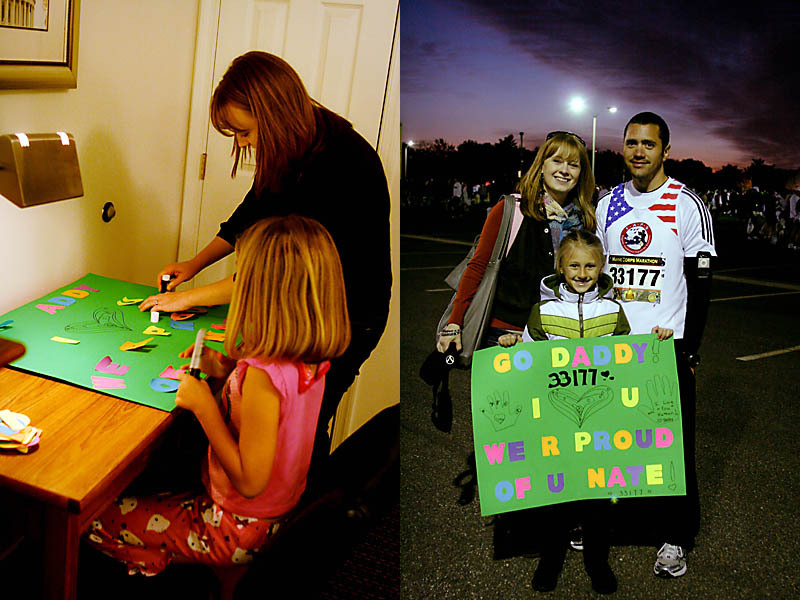 Betsy and Toryn created a sign to hold for Nathan. The morning of the race arrived early and chilly. 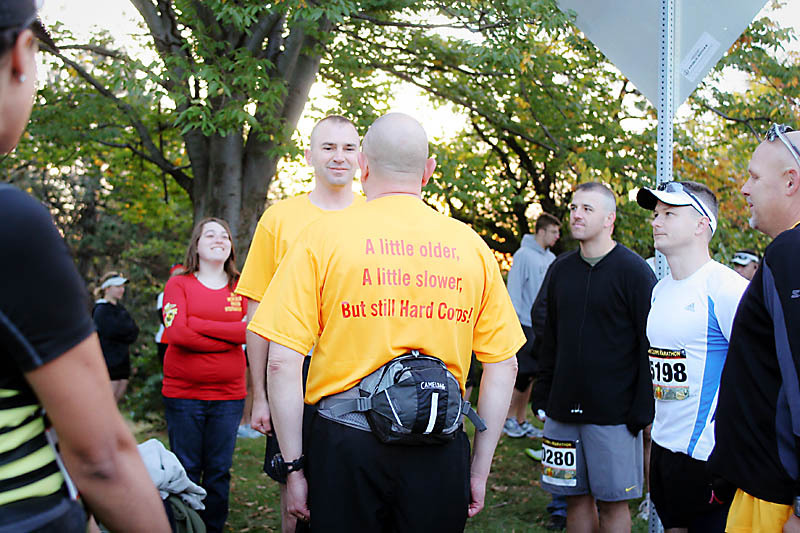 After riding shuttles to the Pentagon parking lot, everyone made their way over to the runner corrals and the starting line. As the start time drew near, this man right next to us reenlisted in the Marine Corps before running the marathon. Awesome. One last hug from Betsy before joining the other runners waiting to start. Did I mention it was Halloween? The course of the marathon was amazing…It began at Arlington and ended at the Iwo Jima Memorial, after winding through the heart of DC. Betsy and I had decided to make our way first to the 10 mile mark, behind the Lincoln Memorial, to try to see Nathan there. On our walk there, I took a few photos that captured the beauty of the race day and scenery. After seeing the runners, I was caught up in the excitement of the race, and I didn’t take any more “scenery” images. But these will give you an idea of the setting. I would like to direct your attention to the 2 runners right behind this car. Just over 50 minutes into the race, they had already passed the 10 mile mark. Did you hear me?? They had run 10 miles in about 50 minutes!!! I was astounded! I was in awe of some of the runners, like this lady on the right below. And okay, I was in awe of all the runners! This guy’s was not. But he was running in a kilt! Oh, hello, Marine Corps One. Lady Gaga and The Mario Brothers were there. And this guy deserved mad props. After that, Betsy, Toryn and I found a good spot somewhere between the 15 and 16 mile mark. There, we saw this crazy guy…He earned himself a spot in the Guiness Book of World Records by running the entire marathon while wearing a gas mask. Seriously. And then, before we knew it, Nathan was happily jogging by again. Insane. He still looked like he was feeling great. From there, we made our way to somewhere around 20 miles. The Washington Monument stood as a backdrop for the runners. Nathan was cruising right along until our yelling caught his attention, and he ran over to say hello. A hug and a kiss, and he was on his way again, down the final stretch. We hopped on the subway to make our way toward the finish line. But alas, this was the closest we would get to the finish line. I guess when you have 30,000 plus runners and 100,000 plus spectators, it can become a mob scene at the end. So, we made our way to the predetermined meeting spot and waited patiently for Nathan. There was lots of laughing and hugging when he found us! I was so very impressed, Nathan! You made it look so easy running your first marathon. I am so proud of you, and I am so incredibly happy I could be there to watch you run and cheer for you and congratulate you in person. 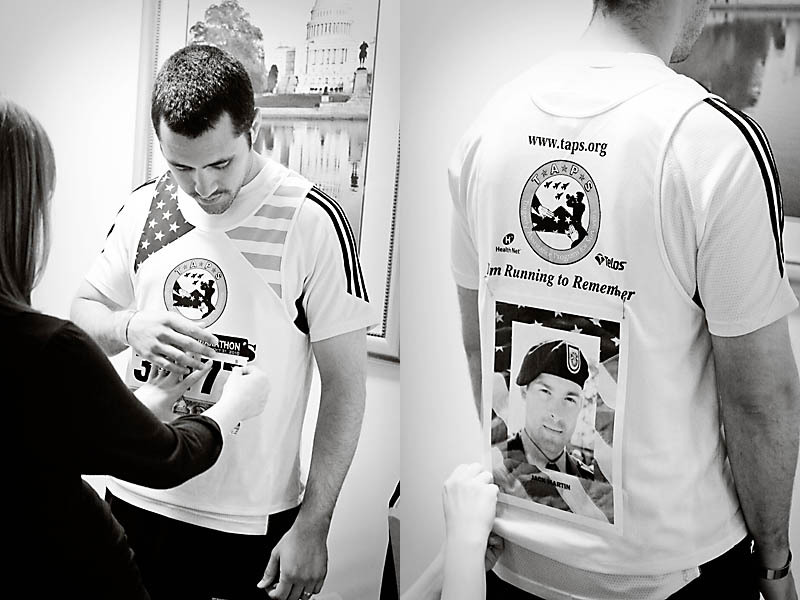 Thank you for running in memory of Jack. That meant so much to me and my family. You know Jack would have been impressed by your training and your run. As I mentioned before, the entire trip was an amazing experience that I will never forget. I want to thank God for blessing me with friends who have become family, and for precious times spent with them. All I can say is WOW! I wish we had jumped in the car and followed you up to DC to see all that in person. Nathan made it all look easy and your photographs made every minute of it look like art. You never stop impressing me!!!!! Love you! I love reading and seeing your trip!!! Fantastic! This is AMAZING Abi. i LOVE your blog. I JUST found it today! I can't stop reading- you are such a gifted writer, and I can't ever say enough about your photos. I love this….please continue! I feel so fortunate to have you in my life! Thank you for being a part of this, it made it that much more special for us! I love you, girl! Great photography, Abi. Thanks for helping us "be there."